How your trees overwinter depends somewhat on your hardiness zone. Leaves “stuck” on trees in the winter are not a real cause for concern, except if there is lots of wet, sticky snow or an ice storm comes along. 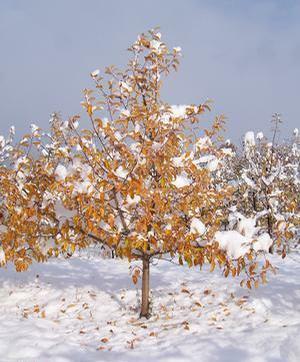 Winter is an important season in the development of fruit trees. We have no control over the weather we get. Mother Nature is in charge! While most people think that the trees are basically just waiting for spring, there are many things that go on within the tree we need to understand. How trees go into winter and dormancy is a function of your hardiness zone. Here in Michigan we live in mostly Zone 5 and 6, which is relatively mild compared to the colder climates of the north which may be as low as Zone 2 or 3. And compared to the south, we are often considered pretty “arctic”— that’s why so many Michiganders become “snowbirds” and fly to Florida! In more temperate zones like 7 and 8, fall must seem to come fairly late and the trees will hang onto their leaves for a much more extended time. However, they sense the weather, colder nights, shorter daylight hours, and longer nighttime hours. This starts to send them into dormancy. Leaves start turning colors, growth stops, and eventually leaves should completely drop off the trees. Hopefully during this season, you don’t have any extreme cold events, which can lead to freeze damage of the tissues. In colder zones like 4 or colder, the trees sense the same changes in weather, temperatures and day lengths, and should essentially go dormant in the same fashion, however several weeks to a month or so sooner. The danger of extreme cold events is just as dangerous here as any other zone. In the mid-zone like 5-6, where Grandpa lives and grows. It really is no different than anywhere else. It is interesting that Grandpa has fielded several questions this year from people who are worried about the amount of leaves still hanging on trees. They are worried that this is a problem. The simple answer is that it often happens some falls and usually doesn’t cause any problem for the tree. The biggest problem with a lot of leaves hanging on the trees in the late fall and early winter is the likelihood of breaking branches if a heavy snow comes. Here at Grandpa’s Orchard, we have had a late fall and there are a lot of leaves still hanging. Just before Thanksgiving, we had a heavy “lake effect” snowfall and accumulated about 14 inches in about 24 hours. Luckily it wasn’t particularly wet heavy snow, and although it collected on the trees, a little bit of wind easily started to knock it off. A week later, we had enough warmer weather that it has all disappeared, except in the snow banks. You have to be a Michigander to appreciate the weather here! Often in less snowy states, freezing rain and sleet are likely to offer the same chances of physical damage to the trees as snowfall, and actually may be more dangerous. The weight of a ¼ inch of ice on trees is probably more than 5-6 inches of snow accumulation. Trying to strip leaves off the trees by hand can be done, but it is a lot of work. Most likely in places where there are still fair amounts of hanging leaves, the leaves will start to come off over the next few weeks anyway. Sometimes you still may see a few left in the spring. It really isn’t too much to be concerned about. Extreme temperature changes in the fall and early winter are in fact potentially more dangerous and damaging than hanging leaves. It seems that most of the country has experienced a relatively mild early fall. There may not have been the regular frosts and freezes that a normal fall season would have, so the trees have really taken their time going dormant. In some areas there have been some really wicked weather systems come through with extreme cold. Your fruit trees may possibly have been damaged by these events. Unfortunately, there is really nothing you can do about it except wait for spring and see how well the trees develop when the weather turns warmer. In Michigan, Grandpa has learned over the years that most “winter” damage really occurs in the fall when we have a sudden drop in temperature in early November to December. Weather in the 30s is good and not a problem, but temperatures that drop into the single digits or below zero will almost always result in some damage, and sometimes tree loss. This kind of damage can vary widely from place to place. Usually by mid-December, trees have acclimated to winter temperatures and so normal winter temperatures swings can be easily tolerated. If temperatures stay low, the trees tend to gain hardiness and can withstand colder extremes, but if temperatures fluctuate widely, they don’t stay as hardy and so cold extremes can be a problem. A “January thaw” is one of the times when trees can tend to lose hardiness quickly. Then real cold extreme temperatures that sometimes follow can often result in tree damage and possible tree death. No matter where you live, you have to survive these extremes some years! It seems to be Mother Nature’s way of telling us who is boss. The most important physiological activity that happens in the trees during the winter is the accumulation of “chilling hours” which allow the tree to break dormancy in the spring. Warm winters that don’t provide enough chilling hours can cause problems for some varieties in the south, west and other mild areas. If the trees are on semi-standard roots like EMLA 111 then it can take that many years for them to start blossoming and setting fruit. Also, if you are keeping them too vigorous, that will delay things. It is odd that a variety like Honeycrisp would have blossomed by now, but a Northern Spy is notorious for taking forever to bloom and fruit. ← Grafting your own fruit trees.